From Coach Spenny we have the following report of the U19’s opener against JBA. This age grade has been increased from U18 to U19, not sure of the reasoning, maybe Head Office has hopes of better retention figures, we’ll see. Sounds like a lively start to the season and good to see James Bay junior strength on the up and up. 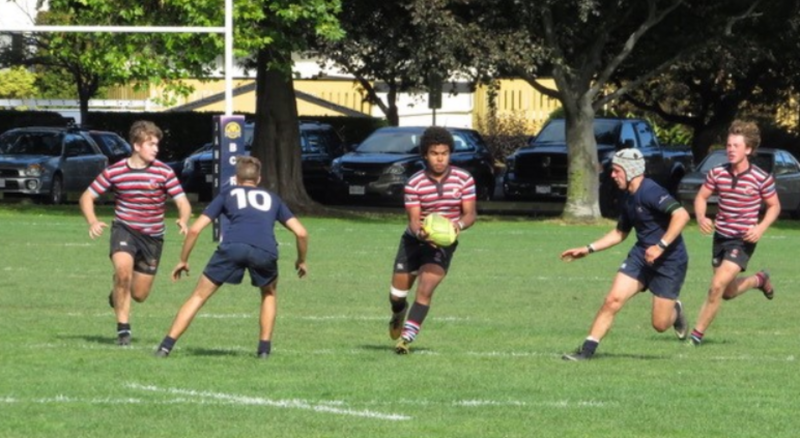 The Men’s Islanders took on the Uvic Saxons as the curtain-raiser to the curtain-raiser at 11:00 a.m. on Saturday. The Islanders were a little thin on numbers for their opening hit out and the final score went something like UVic 40 CW 7. A shout out to old boys, newbies and bottle washers as this match will be replayed for comp points on Saturday and the Divvies and Prems are on the road with full contingents. If a mere 50% of those old blokes playnig touch last Saturday was to don the cleats, we would be off to the races!! The Islanders play the Saxons on Saturday at The Park. Pictured are the CW contingent involved with B.C.’s winning U16 Boys team at the Western Canada Regional Championships this summer. From left to right; Shane Muldrew (Head Coach), Matthew Gordon, Owen Smith, Max Abercrombie, Joshua Mao, Vanya Smith (Manager), Aaron Cook (Assistant Coach). CW notes that Matt Gordon is “giving back” this season by lending a hand with Minis. ‘onya, Matt! CW would like to remind those supporters who have registered with an on-line payment, that your renewal is an automatic notification. To anyone interested this is an easy option to support your club with an annual subscription ( Supporters Club ). Our operational costs are expensive and any contribution would be gratefully appreciated. The club also wishes to remind followers that we do have some CW gear available for on-line purchase. The orders are filled at the end of each month. The Store can be accessed HERE.